This guide shows how to root and up ROM for Samsung Galaxy Tab 10.1 wifi version using ClockWorkMod Recovery. Important: you should backup your data before processing. - First, you need to install Kies software to sync Tab with your computer. - Install Tab driver GT-p7510_USB_Driver_v1_3_2360_0-Escape.exe in your computer. - Connect Tab to your computer. - Hold the Power button and choose Power to turn your Tab off. - Hold both buttons Power and Volume Down (next to Power button) at the same time right after the SAMSUNG logo appears to go to the BOOTLOADER mode. - There are 2 icons on the screen now: the left icon is RECOVERY mode and the right icon (robot icon) is DOWNLOAD mode. You can use the Volume Down button to move and Volume Up to apply. First, you choose the right icon to go to the DOWNLOAD mode. - In the DOWNLOAD mode, the ODIN program will start. - After this step, your Tab will reboot. From now on, your Tab has CWM Recovery. - Connect you Tab with your computer. Copy file Samsung_Gaxaxy_Tab_10.1_root (zip) into the root folder of your Tab. - Turn off your Tab. Turn on your Tab to BOOTLOADER mode and go to RECOVERY mode. In this mode, use 2 buttons Volume Up and Volume Down to move and Power button to select. - First, you choose Wipe Data > Factory reset. Next, choose Yes - - delete all user data to erase all data. You should do this step for each time of uploading ROM. - Back to the main menu of CWM Recover, choose install zip from sdcard. Choose choose zip from sd card and specify Samsung_Galaxy_Tab_10.1_root.zip. 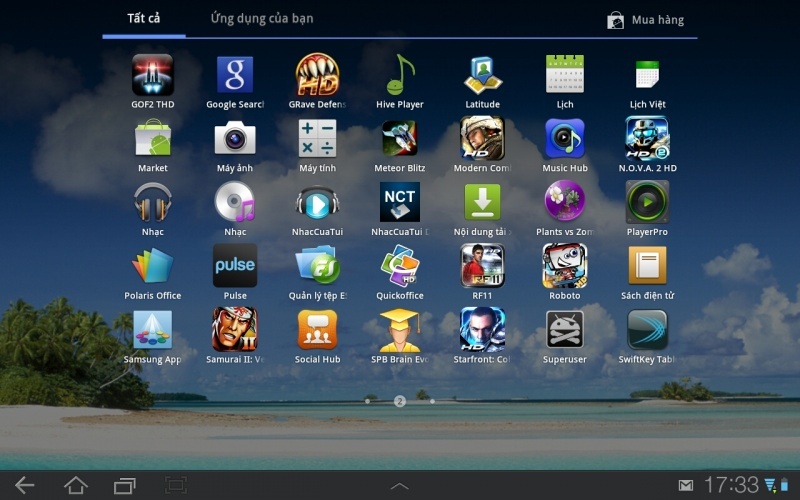 Next choose Yes – Samsung_Galaxy_Tab_10.1_root.zip. - Wait about 5s and choose reboot system now to restart your Tab. - You can go to xda to choose and download your ROM (.zip). With CWM Recovery, you can up ROM easily. - Besides, you can up Kernel which helps your Tab run smoother, save battery, and speed up CPU from 1.0 GHz to 1.6 GHz. If you want to unroot, first, you need to download this file. Then, you can use ODIN to delete CWN Recovery and reset your Tab. Few hours ago I formated the /system from my tab... Do you know any way to reinstall it? hummm, if you haven't backup the system folder, I think you should find another galaxy tab and copy the system folder to your tab. You may try to use Odin and install the stock rom firmware to bring the software back to its original state.